Took awhile to clean up the image, though, after four days, I'm still not too happy with how it turned out. Still, it looks a lot better than when I first found it. ^^;; I made this as a birthday gift for a friend who is still a fan of Pokemon. The new season is quite good, and yes, I still watch it and still am a fan of it. great, I thought I was the only one that liked Pokemon ^_^' nice wall, got more? Aww, so cute! She's my favorite character from the new season! aww.. cute wall =3 i love the effects and stuff :D although it might look better without the mosaic grid stuff... but other than that it looks really pretty =) it's really hard to find nice pokemon walls these days :\ so i think u should make more :D !! what a lovely wallpaper of May and her Torchic, the colors really combined with those two... I like it! Cute wallie you made there, Great job. I think May is the cutest in Pokemon! Great wallpaper! Good job! Hey, dude! Y not making it my birthday present 2o? I found ur pic on July 2006 n I really like it, not 2 mention it's my birthday in this month :) ! Thinking Torchic is a Fire-type Pokemon. I'm also a die-hard fan of Pokemon, n I juz wanna say, May is so cute! Thanx 4 the pic, 4 that's the 1st pic with May in it that I found :D ! Thanx again, n that's going 2 my favorites (May is so cute!)! Ilove My1s. You're have more wallpapers of May ? I love May's. You're have more wallpapers about May's ? 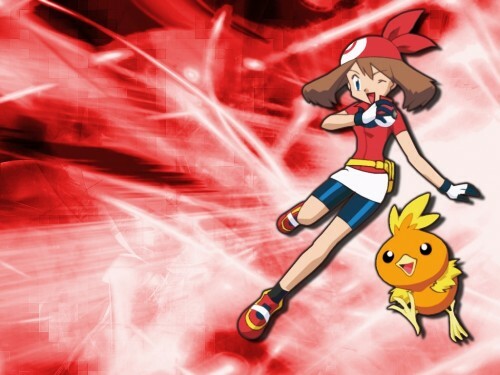 Oh, May and Torchic are so cute! This wall is simple and adorable!